Begonias exist in hundreds of forms and have long been popular with gardeners. Some species are coddled houseplants with showy, often fantastically shaped and patterned leaves. Others thrive outdoors as annuals and bloom colorfully in the shade in containers and as bedding plants. Less widely known, but quite lovely, is the hardy begonia (Begonia grandis), a perennial species that will survive winters in Brooklyn and throughout USDA Zones 6–9. 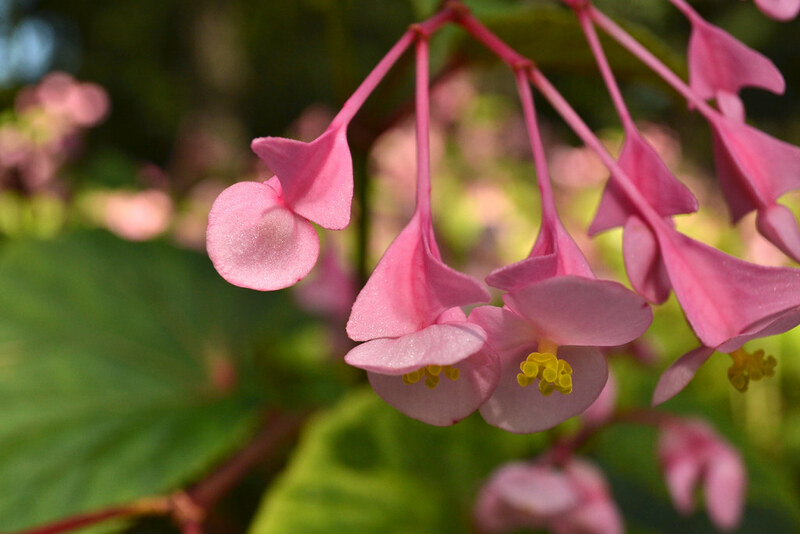 This begonia has bright green heart-shaped leaves and dangling clusters of delicately fragrant pink or white flowers. It is a late bloomer and provides color in midsummer to early autumn when spring flowers have mostly disappeared. It is quite useful planted in beds with spring bulbs since it doesn’t appear until after they have faded. You can observe this planting technique at Brooklyn Botanic Garden, where hardy begonias have recently been placed among the spring ephemerals in Bluebell Wood. When the azure carpet of bluebells finishes its spring show, the begonias are just about ready to take over the display. The esteemed late garden writer Allen Lacy was a big fan of Begonia grandis, but it was not the flowers or the shape of the leaves that endeared it to him. He particularly loved that the undersides of the leaves are bright red and planted them in his own garden in a spot where they would catch the light of the setting sun from behind. Backlit by the sun’s waning rays, the plants offered “a sight that is one of the epiphanies of autumn,” Lacy wrote in the New York Times. 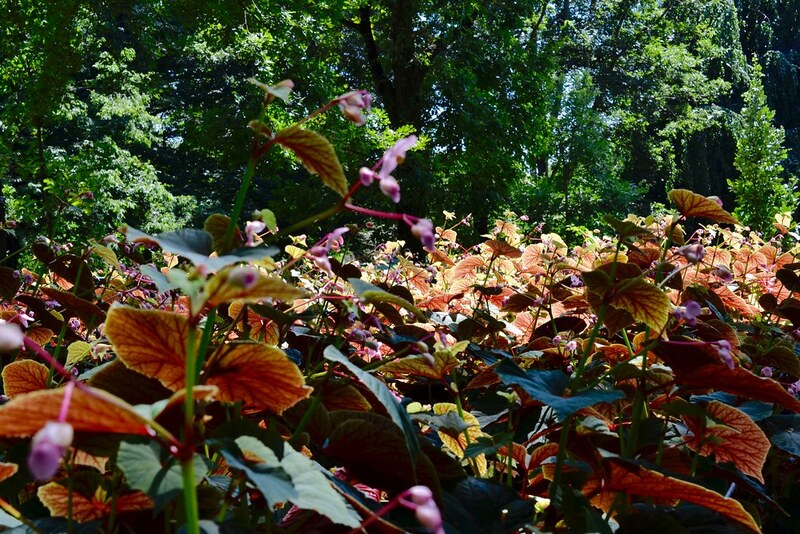 Rarely exceeding three feet in height or width, hardy begonia pairs well with shrubs and trees and gives color and interesting structure to a woodland garden populated by hostas, hellebores, and ferns. Although it is an Asian species, originally found in Japan, China, and Malaysia, it cohabits nicely with native plants such as black cohosh (Actaea racemosa) and wild ginger (Asarum canadense). In the proper growing conditions, hardy begonia will thrive with minimal gardening effort. Plant it in dappled or full shade where it will not receive any direct sunlight. The soil should be rich and moist but with good drainage. Sopping wet conditions can easily cause root rot. Since the plant is quite delicate, it should be located in a spot sheltered from wind and out of the way of foot traffic and pets. Once established, hardy begonia will tolerate some dry spells, but in general, it likes to be well watered. Mulching after the plant has gone dormant in the fall will help it survive even an especially frigid winter. Add some compost in the spring to get your hardy begonia off to a good start for the growing season. Deadheading spent flowers will encourage continuous bloom from July into the fall. As temperatures begin to cool down at the end of summer, the plant will visibly deteriorate, quite literally falling apart. At this point you may be tempted to tidy up by gathering the remains and taking them off to the compost heap. Resist this urge. 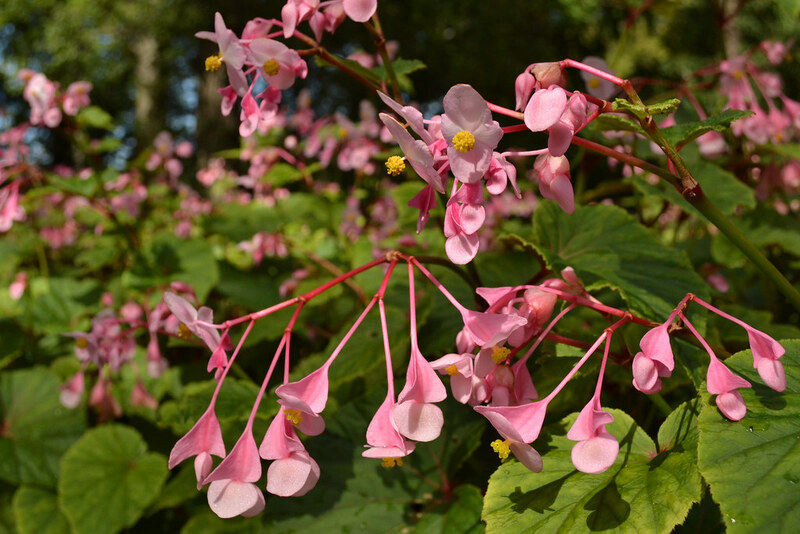 One of this begonia’s most endearing talents is its readiness to naturalize. It will grow from seed, but more commonly it produces tiny bulbils in the axils of its upper leaves. These bulblets—actually nascent tubers—will eventually drop to the ground, and the following spring, they will produce new clones of the parent plant. Eventually, a whole Begonia grandis colony can form this way. Composting or otherwise disturbing the plant will interfere with its built-in system for self-propagation. If you prefer to have these bulbils grow in a different spot or even in a container, you can remove them by hand and place them where you want them. Press them gently into the soil but don’t bury them. They need light to develop. Remember to mark where your hardy begonias are planted. Since the foliage dies completely back to the ground in the fall and does not appear until late in the spring, it is very easy to forget where your plants are. In a frenzy of spring cleaning up and planting, it’s all too easy to dislodge them, even to plant something else in their spot. Hardy begonias with white flowers are somewhat less common than those with pink blooms. This one produces pure white flowers with yellow centers on bright pink stems. As the petals age, they fade to a pale pink color. In recent years, hybridizers have had some success creating cultivars of the perennial begonia. During its first year, ‘Torsa’ mimics the species in stature, but in subsequent growing seasons it quickly outpaces the original plant. When mature, it can produce leaves nearly 20 inches wide—triple the size of those of the species. Begonia grandis (hardy begonia) in Bluebell Woods. Photo by Blanca Begert. 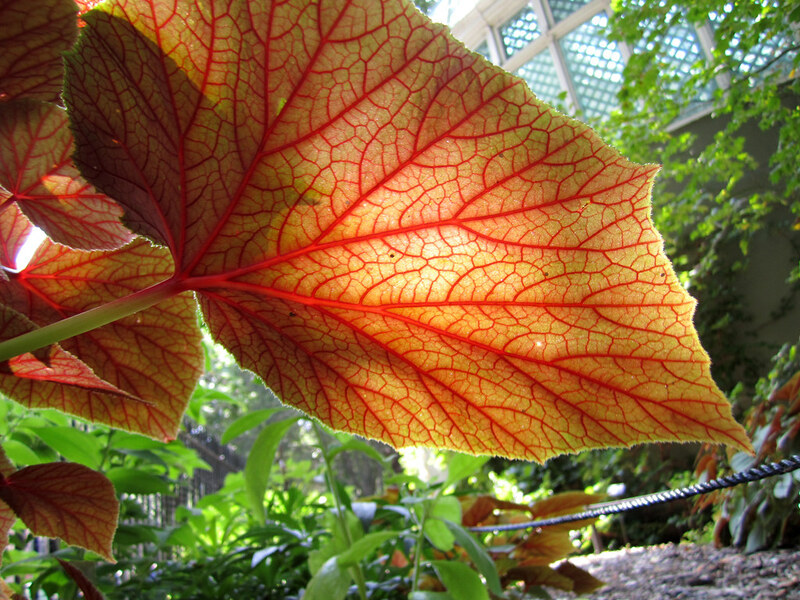 The heavily veined underside of a Begonia grandis leaf in the Woodland Shade Garden on Washington Ave. Photo by Dave Allen. Begonia grandis (hardy begonia) foliage glowing in the sun. Photo by Blanca Begert. Begonia grandis (hardy begonia) in Bluebell Wood. Photo by Blanca Begert. 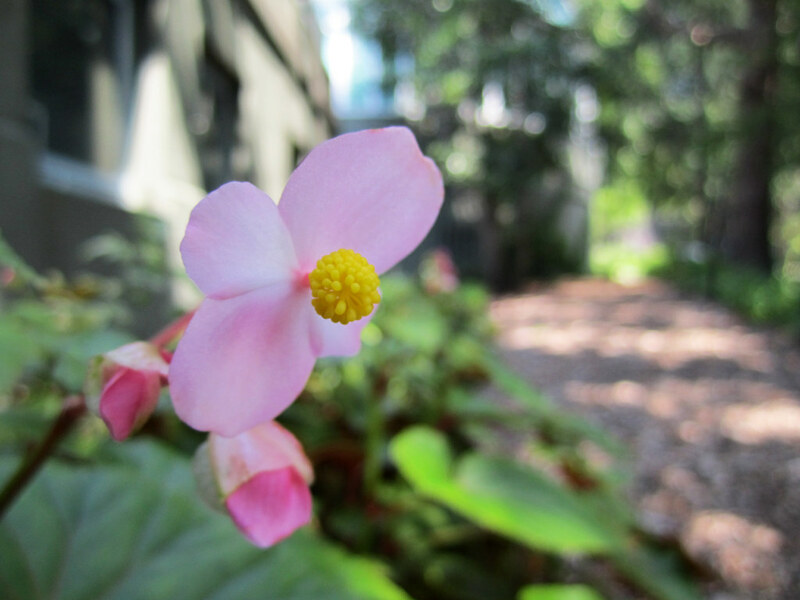 Hardy begonia (Begonia grandis) blooms in the Woodland Shade Garden on Washington Avenue. Photo by Dave Allen.